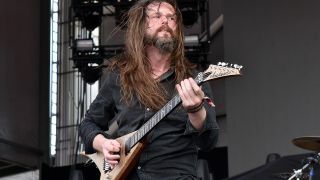 The death of All That Remains guitarist Oli Herbert is now being treated as “suspicious” according to local reports. Herbert died last month, with his widow Elizabeth stating last week – in a now deleted post of Facebook – that the cause of death was drowning. The musician was found to have unprescribed anti-depressants in his system at the time of his death. But the Hartford Courant (via Alt Press) are reporting that the manner of his death is now classed as “undetermined” with Chief Medical Examiner Dr James Gill saying that the case will remain that way unless new information comes to light. The paper adds: “State police sources said they are treating Herbert’s death as suspicious at this point. The Eastern District Major Crime Squad is investigating. Herbert’s body was found in a pond close to his home. All That Remains are asking fans to submit their guitar covers to honour Herbert’s legacy. Find out more.